This is a very smooth, incredibly soft, medium-twist 3-ply yarn made from 50% silk and 50% merino. It gives very good stitch definition, so it’s ideal for cables and lace. I use it for anything I want to wear against my skin – especially scarves and socks. Please note that this yarn is not a superwash yarn, so it will felt and shrink if washed in the washing machine. Hand wash in lukewarm water to preserve the shine and drape of this luxurious yarn. 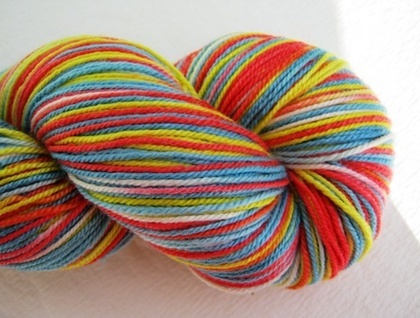 This skein weighs 100g and is app. 370m long. My hand-dyed wools are non-repeatable runs, which means once they’re gone, they’re gone for good. Please hand wash your wool with care. Wool labeled “superwash” you can cold machine wash. I take great care to achieve beautiful results that are lightfast and colourfast, but sometimes there is a tiny amount of colour running out of the wool at first, so wash your item separately. Please contact me if you live outside of New Zealand. I will combine postage when possible. When choosing colours please keep in mind that not all monitors show colours the same. If you’re not satisfied with your wool you can return it to me in original condition, i. e. with label attached and at your own cost in exchange for different wool or a refund. If you’re happy with your wool, please let me know and don’t forget to place feedback. Contact sabine to enquire about payment or shipping options.